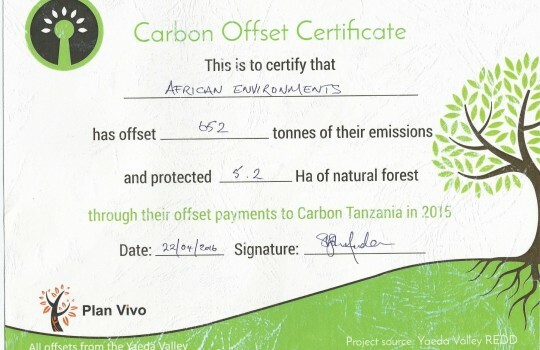 African Environments was last night proud to accept the 2015 Carbon Offset Certificate from Carbon Tanzania at an event held in Arusha, at Arusha Coffee Lodge. African Environments offset 652 tonnes of emissions for 2015 protecting 5.2 hectres of natural forest. African Environments has been partnering with Carbon Tanzania for over two years now through encouraging our clients and agents to choose to offset their travel emissions. We whole-heatedly support he great work Carbon Tanzania does and look forward to continuing our partnership!